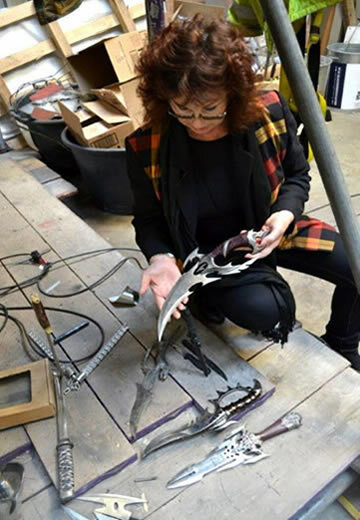 Angel Monument…the angel monument is being constructed using donated knives, turning weapons collected from amnesties to make a monument to peace. Raising awareness of the enduring consequences of such violence and what it may mean to carry weapons. We are immensely excited to be involved in this project, the creation of a national monument and the anti-violence campaign backed by affected families, Police & Crime Commissioners, Police Forces and importantly the concerned public! 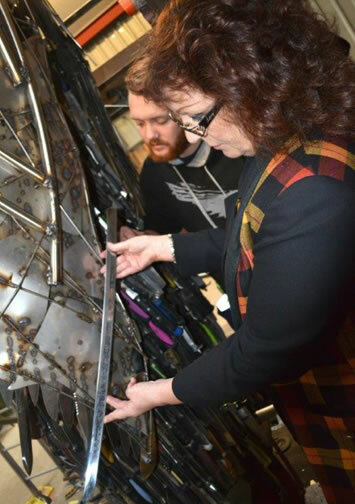 Ann Oakes-Odger MBE meets Sculptor and Artist Alfie Bradley, responsible for constructing the Angel in the workshop at the British Ironwork Centre. 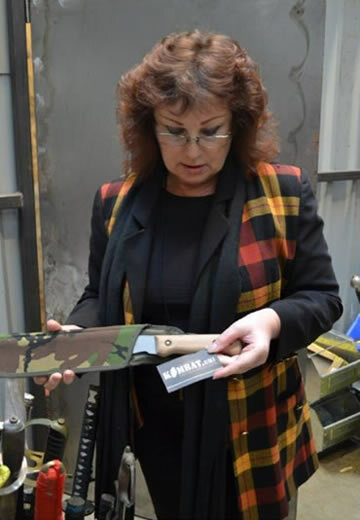 The British Ironwork Centre has pledged that all weapons handed in across the country would be used to make a sculpture to peace, dedicated to all victims of violence. 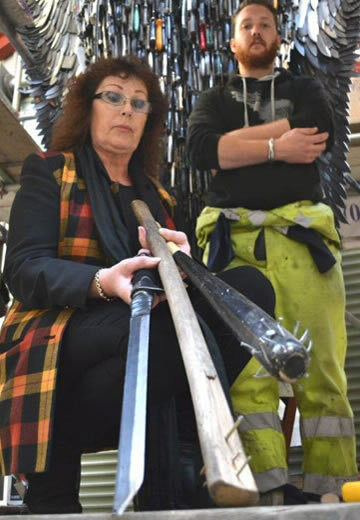 At the heart of this incredible campaign is the iconic Angel sculpture, being crafted at the centre by Alfie Bradley. 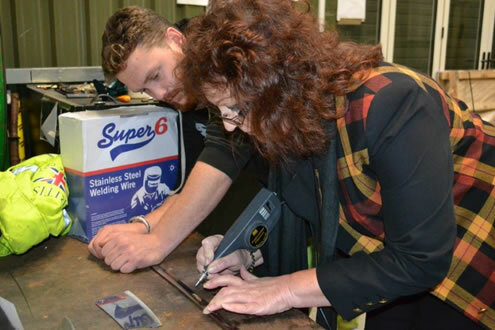 Ann is seen here symbolically engraving a message of love from all of Westley’s family, Alfie having given her an ‘all important’ tutorial beforehand! 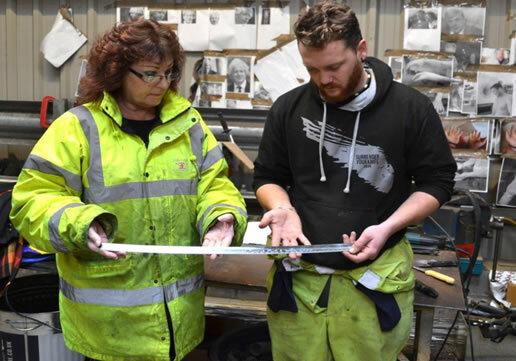 Having checked the memorial engraving, Ann prepares to take part in the welding of the blade to the monument…the start of the formation of the Angel’s wings. The Angel is an immense structure standing approximately 26 feet high! "I feel overwhelmed at being able to leave this lasting message to Westley on this amazing Angel. Before seeing it, I had no prior conception of just how bold, imaginative and representational of one’s feelings of ‘why’…why are we seeing so many lives destroyed by violence! The Angel is an inspirational symbol of peace…representing a stand against violence and aggression in all forms on our streets!" 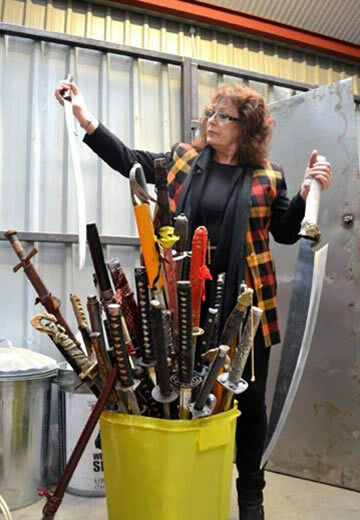 ’No to Knives…No to Weapons...No to Violence! Allison Cope…mother of Joshua Ribera, a young rap star with a bright future based in Birmingham, was fatally stabbed in 2013 outside a memorial event for another talented young artist, Kyle Sheehan. Kyle was also fatally stabbed just a year earlier. When a life is taken in this violent way the trauma ripples through the family, friends and local communities. We support one goal of ridding our streets of violence and preventing senseless killings. 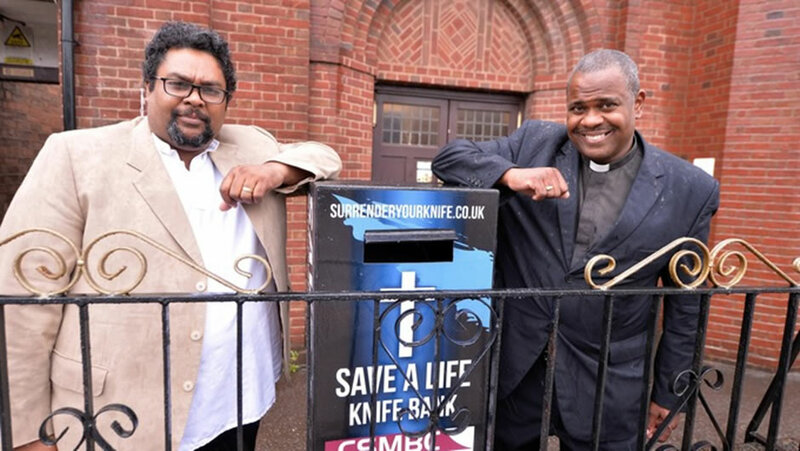 A Birmingham Church has placed a Knife Surrender Bin out its doors with the message of hope of reducing violence. 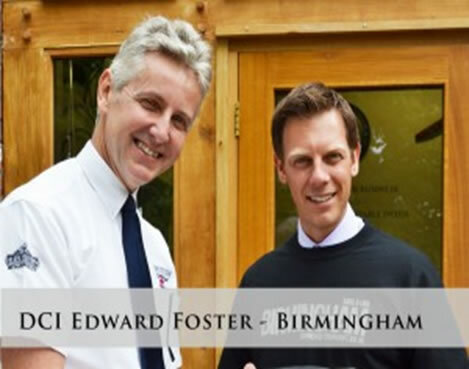 The initiative was unveiled at the Handsworth Cannon Street Memorial Baptist Church, with deputy police and crime commissioner Yvonne Mosquito present. 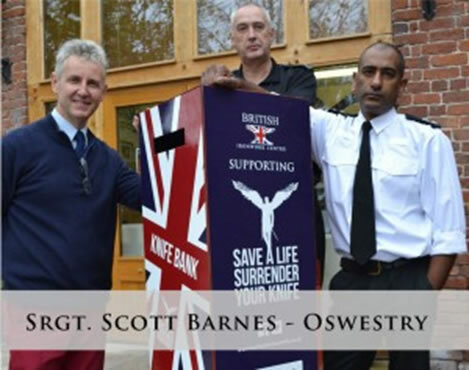 The first knife bin to be provided by the community and follows news that bladed weapon crime in the West Midlands has increased by nearly 10 per cent. Home Office figures showed knife crime convictions in the area are half what they were in 2009. 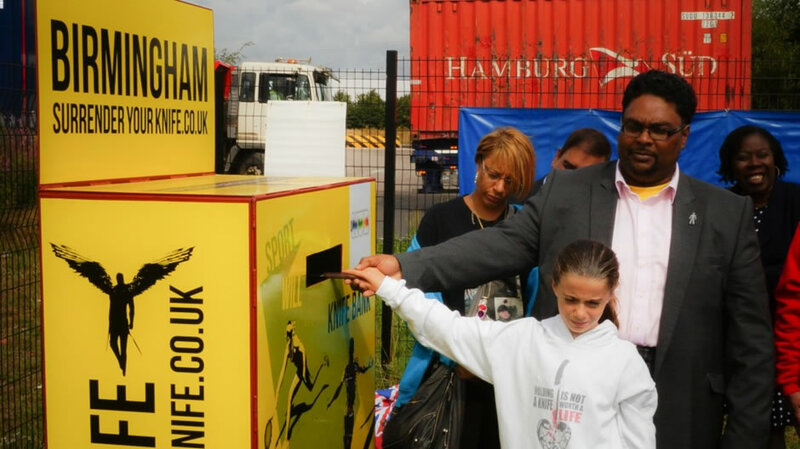 Desmond Jaddoo, founder of community group Birmingham Empowerment, arranged for the bin to be placed outside the Soho Road Church. Installation costs were covered by the congregation and the bin itself was donated by British Ironwork Centre, Oswestry. But Desmond stressed that the receptacle is only one small part of a wide initiative to end the menace of armed crime in Handsworth. “Just having the bin there is not enough, the church is already doing work in the community to change minds. If everyone in the community sings from the same hymn sheet, it will make a difference. 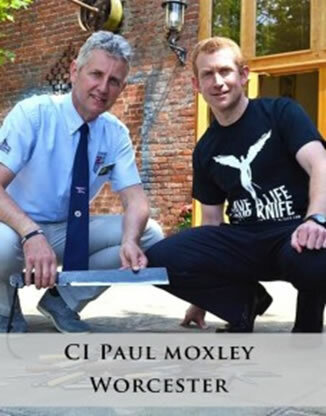 “And remember, knife crime is not isolated to young people. 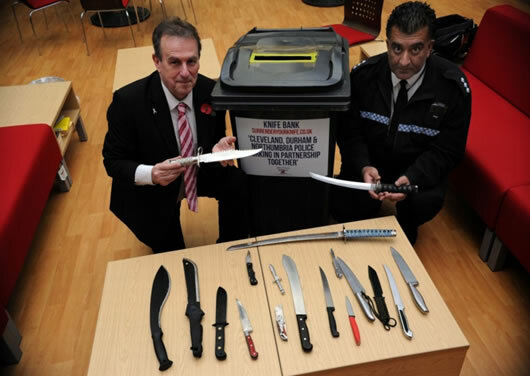 In March, 2015, the Birmingham Mail reported during 2013-14 West Midlands Police recorded 1,659 offences involving knives. The year before, the figure was 1,508. 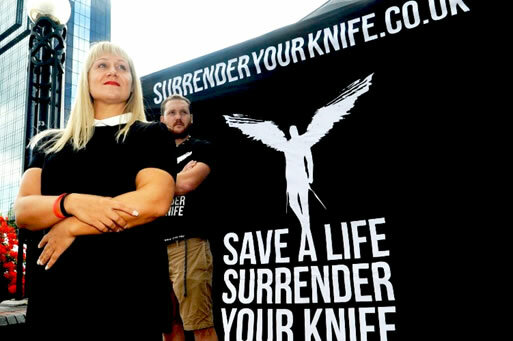 Clive Knowles, Chairman of the British Ironwork Centre has met with a number of Police Forces personally promoting the ‘Surrender your Knife’ campaign. 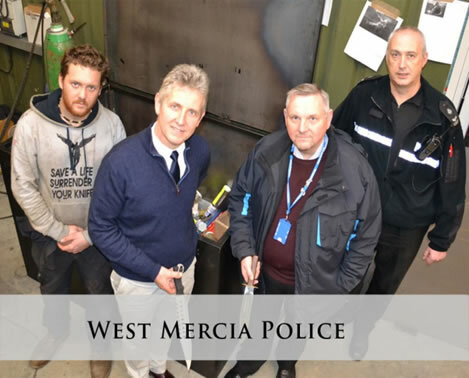 Alfie Bradley the Sculptor and Artist responsible for constructing the Angel is also seen here in the West Mercia Police photos above. “We are pleased with the response we have had in Cleveland. 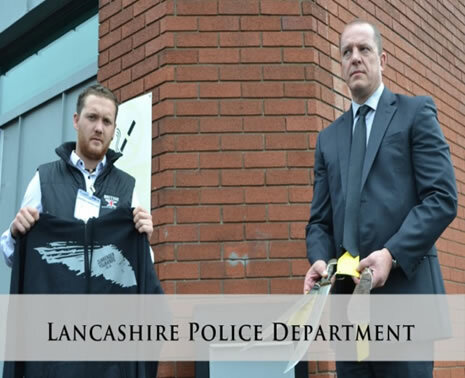 Each item handed in represents one less potentially dangerous knife which could end up being used to harm someone or used in other crime”. 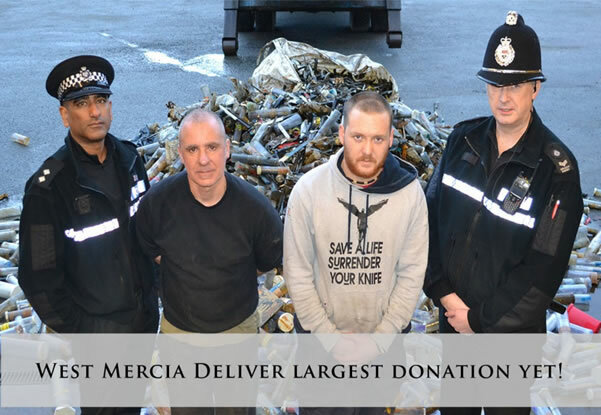 A total of 245 knives and other bladed items were handed in to police during a two-week knife surrender campaign. 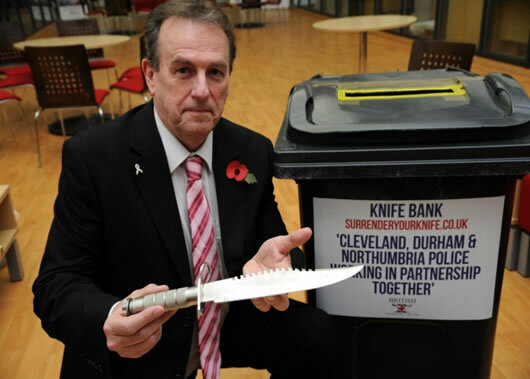 Earlier this year it emerged that Teesside was the knife crime capital of England and Wales. The area had knife crime rate of 50 for every 100,000 people living in the area - the highest rate out of all 43 police forces in England and Wales for 2014.